Grand opening ceremony for the new Palomar College Library/Learning Resource Center. After years of anticipation, the spectacular new Library/Learning Resource Center (LRC) opened in the heart of the San Marcos campus for the start of the Spring semester last month. 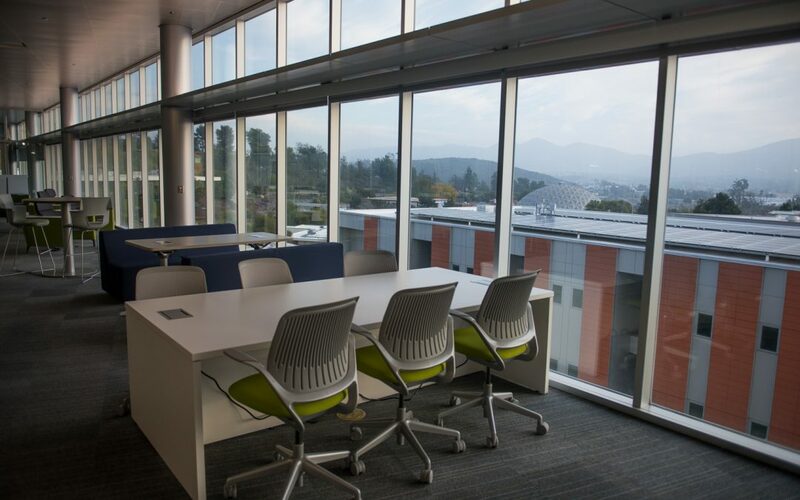 The four-story building has approximately 85,000 square feet of space, offers stunning views from the study room on the top floor, and delivers state-of-the-art computer labs along with new reference desks, book stacks and cozy study nooks on every floor. In the first two weeks of operation, nearly every space in the LRC has been in constant use by Palomar students, whose feedback has been overwhelmingly positive. The grand opening ceremony will conclude with photo opportunities with Palomar College administrators and distinguished guest speakers as well as VIP attendees. Tours and refreshments will follow the ceremony. The LRC is located adjacent to the Humanities building and the parking structure. The ceremony will be held on the courtyard in front of the main entrance. Parking will be available without a permit in Lot 12 during the hours of the event.